” The National Guide is a practical resource intended for all health professionals delivering primary healthcare to Aboriginal and/or Torres Strait Islander people. 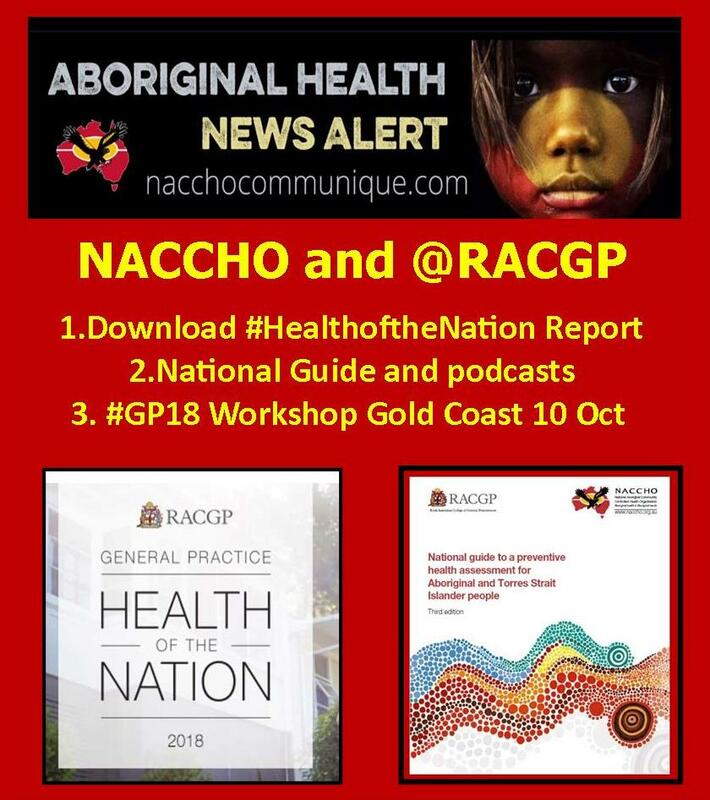 The reviewing and updating of the second (2012) edition of the National guide to a preventive health assessment for Aboriginal and Torres Strait Islander people (National Guide) was a joint initiative of the National Aboriginal Community Controlled Health Organisation (NACCHO) and The Royal Australian College of General Practitioners (RACGP). 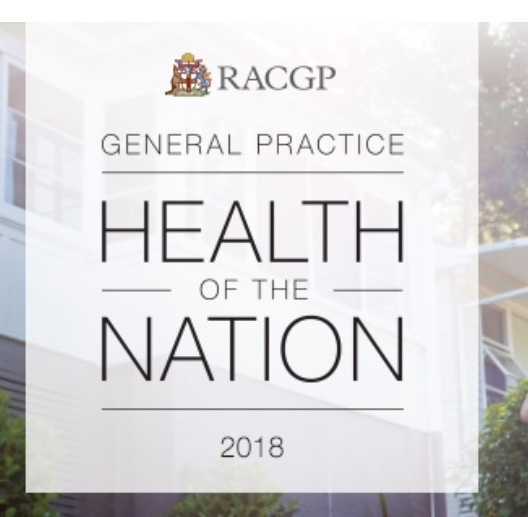 Part 1 :For the second year, the Royal Australian College of General Practitioners (RACGP) has : compiled its annual health check-up on general practice, showing the areas where Australia’s primary healthcare system continues to thrive, whilst also highlighting areas of concern. The report highlights the reasons why patients see their GP and how patients interact with the primary health system. It also flags areas of major concern which need to be addressed to help ensure that Australians maintain healthy lives and stay out of hospital. 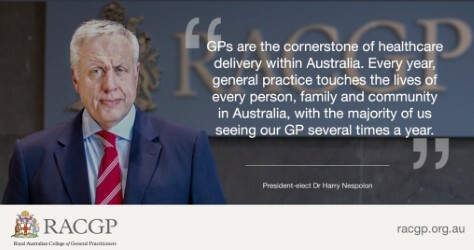 “Patients have shown strong connections to general practice, nearly 80% of patients can identify their own GP and can see them when needed. “But the report also highlights areas which require urgent attention so that general practice does not get left behind, and patients are not short changed. despite general practice being the most widely accessed healthcare service, it receives less than 9% of overall government healthcare funding. “If there is not a substantial and coordinated push to address these persisting health issues, – I am fearful of what the future may hold for Australia’s healthcare system..
advises on activities that can help prevent disease, detect early and unrecognised disease, and promote health in Aboriginal and Torres Strait Islander communities, while allowing for local and regional variations. 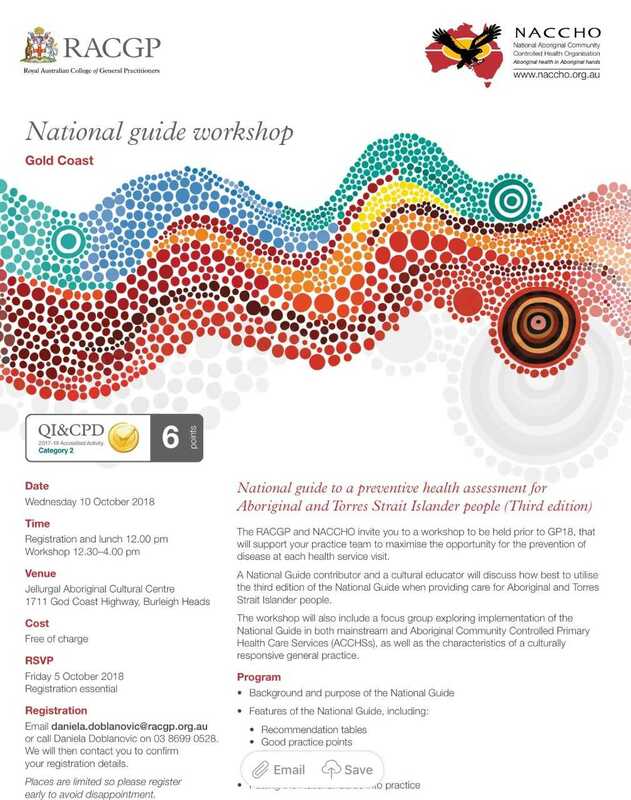 The National Guide can be used in conjunction with the RACGP Guidelines for preventive activities in general practice ‘red book’ and with the Medicare Benefits Schedule rebate item 715: Health assessment for Aboriginal and Torres Strait Islander people. Subscribe to the National Guide Podcast to hear host Lauren Trask, NACCHO Implementation Officer and CQI expert, speak to general practitioners and researchers on updates and changes in the third edition of the National Guide. Listeners will hear about the latest evidence on a range of topics from authors of the National Guide – grassroots general practitioners and researchers with experience working with Aboriginal and Torres Strait Islander peoples as well as Aboriginal Community Controlled Health Services. 9 – Episode five: Oral and dental health with Dr Sandra Meihubers. 14 – Teaser: The National Guide Podcast. What’s it all about?